I thought I was being so organised this week. As I was going for dinner at a friend’s house last night and taking the pudding, I made the meringue for my pavlova on Wednesday. I did as Delia Smith told me and baked it in a low oven for an hour then left it to cool in the oven overnight. However, when I came to slide it off the greaseproof paper it fell to bits! I decided that even if I smothered it in cream and fruit it wouldn’t pass muster, so I had a little panic thinking what I could do instead. Being the frugal sort, I didn’t want to spend any more money, so before work – at 6.30am! – I was raking through the cupboards looking for the jelly and trifle sponges left over from Christmas. I threw these together with the fruit I had purchased for the pavlova, then rushed off to work leaving it to set in the fridge. When I got home I whipped the cream and folded in some of the broken meringue pieces, then spread it over the jelly. So voila! 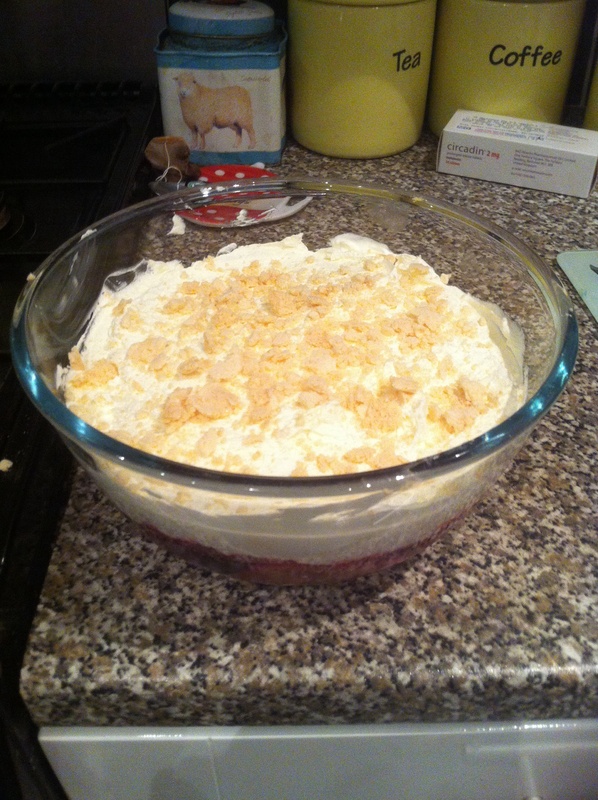 Pavlova fruit trifle, a new Shoestring Cottage creation :-). It seemed to go down pretty well with my friends but they get less fussy after a few glasses of wine! My budget is the same way, so I look forward to reading your frugal tips. The pudding looks delicious! Really enjoying visiting your blog. The meringue creation sounds delicious.